Words That Don’t Work - Communication Works Inc. Communication Works Inc. Words That Don’t Work - Communication Works Inc.
Communication is at the core of all that we do in work and life. Even the most subtle and innate verbal or body language cues can turn an otherwise productive interaction into one filled with doubt, uncertainty or distrust. Or, from a more positive perspective, steer a volatile conversation to more neutral territory. We use anywhere from 2,000 to 20,000 words a day on average. However, certain words, when uttered to another, can cause that person to close their mind and mentally pack up shop. They were triggered by a word that doesn’t work for them. 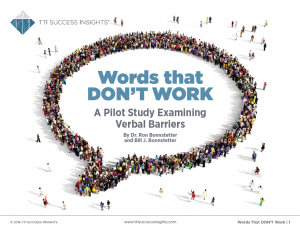 Research shows these words that don’t work are tied to behavioral styles. Based on early research of each style, sets of words that spur negative reactions in the four main DISC styles were identified.